You’ve found your perfect travel accessory. The Timex Weekender Chronograph is the stylish watch you need. Fashionistas, you’ll appreciate the variety you have in this simple style. Pair it with anything. You have the freedom to choose what you want with the interchangeable quick-release straps. Choose what color and fabric you want from a wide selection of options. As a traveler, you know how important versatility is. Take the Timex Weekender Chronograph from the streets to a classy dinner with ease. All of the watches from this Timex line are made using durable materials. What makes them the best watches for women who are constantly traveling? The face of the watch is composed of scratch-resistant mineral glass, they come in all metal cases, and they are water resistant up to 30 meters. But that is not all. The revolutionary indigo backlight provides an easy way to tell time in the dark, the stopwatch function measures time up to 1/20 of a second, and the battery life can last up to 10 years. Yes, you read that right. As we previously mentioned, versatility is key. Timex knows that. The design of the Timex Weekender Chronograph makes it easy to switch up your style. Interchangeable slip-thru bands means that you can change out the watch strap whenever you would like. They offer everything from fabric to leather and a wide selection of colors to choose from. You have got plenty of options. We appreciate that even though the leather straps are thin, they are still good quality. Quality counts. This watch is made using materials made to last. The straps are composed of either real leather or woven fabric, the face has scratch-resistant mineral glass, and each watch comes in a metal case for protection when traveling. We appreciate having a watch that is made to last. The Timex Weekender Chronograph will last you for many years to come. Travelers who prefer the minimalist aesthetic will love the Timex Weekender Chronograph. It’s another good reminder that the best style isn’t busy, it’s one that transcends time. The watch’s backlight is also some of the best on the market. As a result, you can enjoy visibility day or night. Nowadays, it is really difficult to find an affordable, quality piece for under $75. It’s clear to see that every part of the Timex Weekender Chronograph is high quality. And the dial on it is no different. On the face, clear sharp markings make it easy to read. Even under a macro lens, you won’t find any imperfections. The face looks just as good during the daytime as it does at night when it is all lit up. Overall, we think it is a great looking watch. The attractive tan leather band compliments the simple style of the watch face well. If there was any area that you thought a watch under $75 would skimp on, it would be the quality. But we are pleasantly surprised to say that the folks over at Timex have not done that here. 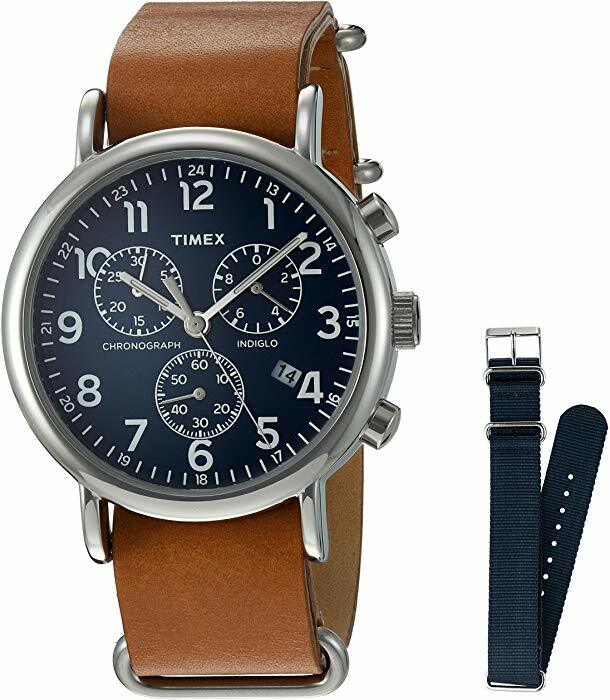 The Timex Weekender Chronograph is well built with durable material items. From the real leather and woven fabric bands to the scratch resistant face, this style is made to last for years to come. The mineral crystal on the watch face is strong enough to resist scratches. During regular wear, you will not have to worry about wear and tear. While we don’t recommend it for outdoor adventures like hiking or swimming, you can definitely wear it out and about in your city explorations. Timex says it has a water resistant capacity for up to 100 feet. With this said, we think it can handle a little bit of rain or a splash of water but it’s not worth risking to submerge it. Taking a look at the strap and clasp, you’ll find they look and feel good with wear. We’ve all had a watch at one point or another that was uncomfortable to wear. The Timex Weekender Chronograph offers a smooth, comfortable fit and doesn’t cut into your wrist or rub your skin. So how do the hour and minute hands move on the Timex Weekender Chronograph? This watch has what the company calls W92. This simple movement powers watches from all around the world. For under $50, the Timex Weekender Chronograph presents an excellent value. With 4 out of 5 stars and over one thousand reviews, this watch speaks for itself. While travelers mentioned that the leather strap is thin, they did not seem to care too much about it. After all, the strap is replaceable. Something they did mention though is that the color on the leather straps are slightly lighter in person than they appear to be online. If you apply leather treatment, it works well to bring out the color and keep the strap in good condition. The dual layer strap gives a more robust look to the watch which is nice. Minimalists liked the small dials on the wrist but that is up to personal taste. The minute marker of the chronograph (upper left small dial) was not in the correct position as others also claimed, but it was a 5 second job to adjust the marker into its correct place by simply following how it is clearly described in the manual what is available on the Timex website. What travelers seemed to love the most about the watch are the night mode and Indiglo features. Overall, the Timex Weekender Chronograph is an excellent watch in terms of price ratio. If you’re looking for something more high end and luxurious, this is not the style for you. This watch is simple and classic all the way. For under $50, it’s a steal. Timex truly is one of the best watch brands for women. Check out our top picks for men's watch brands too. Are you looking for something a little more luxurious than simple? We’ve found just the thing. Citizen makes beautiful styles you can wear anywhere. They go beyond the simple in a lovely yet understated way. 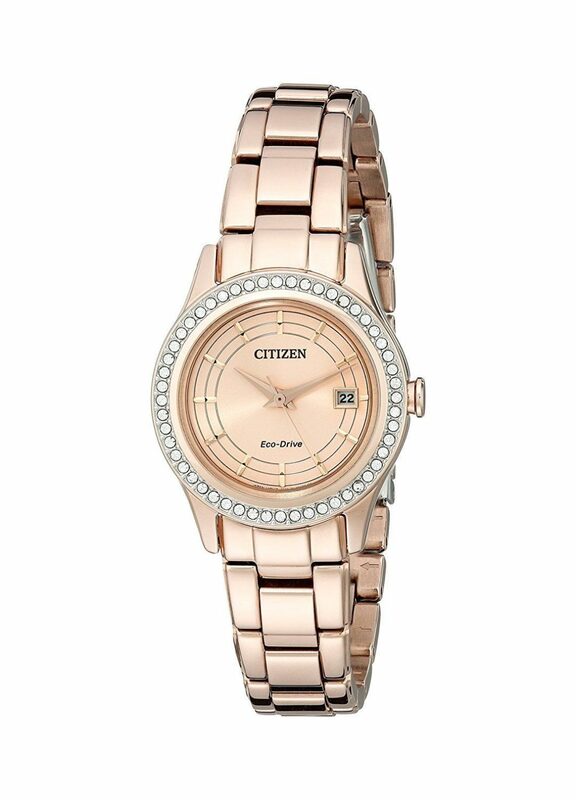 We can’t say enough good things about the Citizen Women's Eco-Drive Silhouette Crystal Watch. Stainless steel, mineral crystal, and sapphire crystal come together in the most elegant way. The brand Citizen pours time, energy, and love into every one of their creations. This two-tone silver and gold watch goes with just about anything. Round crystals at the bezel and silver sunray dial add a beautiful touch. Genuine Swarovski crystals are used to frame the face. When you purchase the Citizen Women's Eco-Drive Silhouette Crystal Watch, you know you will have a durable timepiece for years to come. It’s built with quality. And that’s what counts. If you’re looking for special features, this style has more than just looks in the department of bells and whistles. One of the things that is most convenient about it is you won’t need a battery. Since it uses light for power, it is designed to convert both natural and artificial light into energy. This means that you won’t have to fuss with battery replacement, charging, or winding. In addition, it can also run in the dark. It’s all thanks to the lithium-ion cell. The Citizen Women’s Eco-Drive comes with a low energy warning and power save mode. Get this. When your watch is fully charged, it can run for up to seven years in the dark. Yes, you read that right. But that’s not all. There are also manicure friendly claps. Our second favorite feature has to be the water resistance. While you wouldn’t typically expect a dressy-looking women’s watch like this to be able to withstand exposure to the elements, it can. This Eco-Drive style is water resistant up to 100 meters (330 feet) and is suitable for swimming and snorkeling. We hope you enjoyed reading our article on the Timex Weekender Chronograph. As you can see, there are so many high-quality brands and styles on the market to choose between. The type of watch you need as a traveler depends on where you want to go and what activities you are pursuing on your getaway. The brands and watch styles we included all offer style and function. Sleek minimal looks meet practical design with waterproof elements and a durable design you can take just about anywhere.